Wheelersburg senior Drew Jackson defeated Minford’s Parker Jacobs in straight sets Monday. 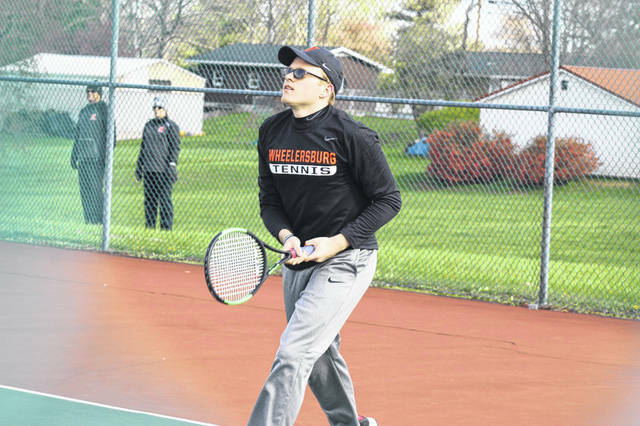 In a match that was ultimately decided in doubles’, the Wheelersburg Pirates picked up a road win over Minford 3-2 to improve to 11-1 on the year. Drew Jackson (W) d. Parker Jacobs (M) in straight sets (6-0, 6-0). Josh Wiehle (M) d. Mason Nolan (W) in straight sets (6-1, 6-2). Logan Davis (W) d. Zac Hammond (M) in straight sets (7-6, 6-3). Adam Cordle, Sam Wiehle (M) d. Carson McCorkle, Rohit Kateria (W) in straight sets (6-4, 6-1). Alex Thomas, Preslee Etterling (W) d. Andy Crank, Alex Cram (M) in straight sets (7-5, 6-4).